NEW: Enhanced styling and Pro-Fit™ accessory integration NEW: Increased suspension travel and refined cab comfort, including standard tilt steering NEW: 20% more towing capacity, now 1,500 lbs. Electric Advantage A quieter machine for operating inside barns or for stealthy trips to the deer stand, the RANGER EV never needs gas, requires very little maintenance, and works harder and rides smoother than any other electric vehicle in its class. On-Demand True All-Wheel Drive With the Polaris true AWD advantage, all four wheels engage automatically when your vehicle needs more forward traction and reverts back to 2WD when it doesn’t. Dump Box with Lock & Ride Cargo System Rear dump box has 500 lb. capacity, gas-assist dumping operation and features the exclusive Lock & Ride cargo system that accommodates many hard-working accessories that can go on and off in seconds. New Center Mount Gear / Voltage Indicators For even easier operation, the gear indicators and voltage indicator have been moved in front of the driver. 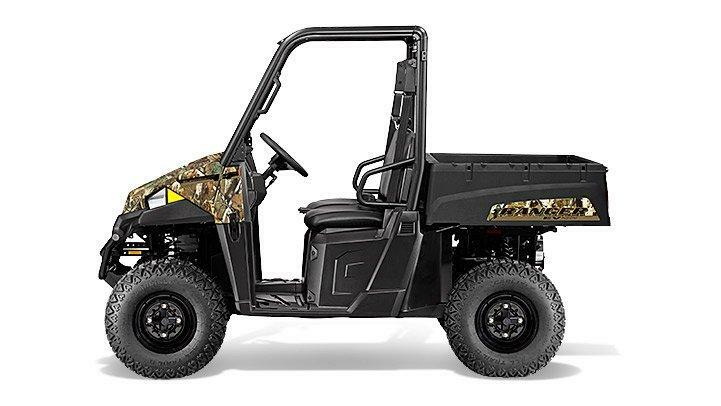 All-Day Riding Comfort We designed the RANGER EV with an ideal seat height combined with wide foot clearance for easy entry and exit. NEW! Plus, experience updated parking brake placement between the driver and passenger for enhanced ease of operation. Smooth Riding Suspension NEW! 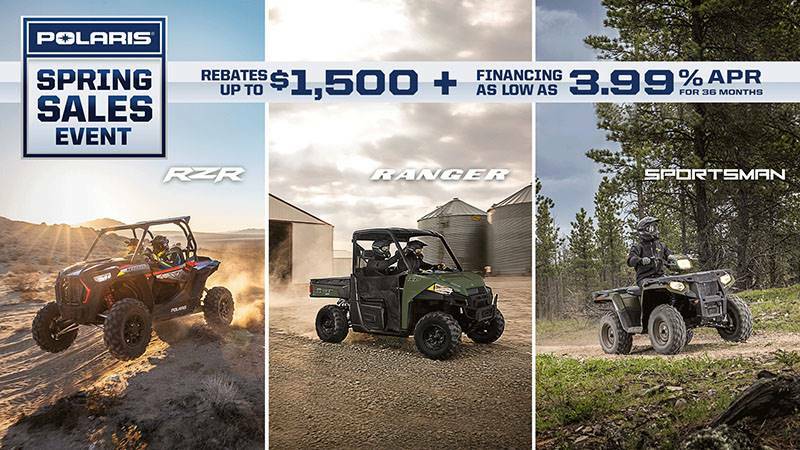 To ensure a smooth ride, the RANGER EV features a full 9” (22.9 cm) of suspension travel up front – an increase of 11% – and 9” (22.9 cm) of Independent Rear Suspension travel. 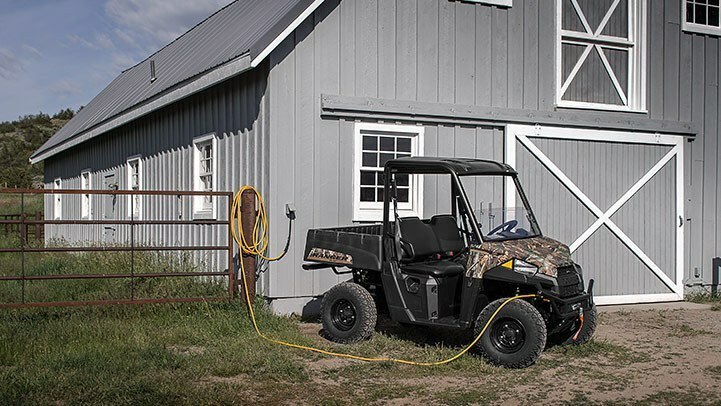 Nimble Handling For nimble handling and a tight turning radius, the RANGER EV features an ideal 72” (183 cm) wheelbase paired with a full 10 inches (25.4 cm) of ground clearance. 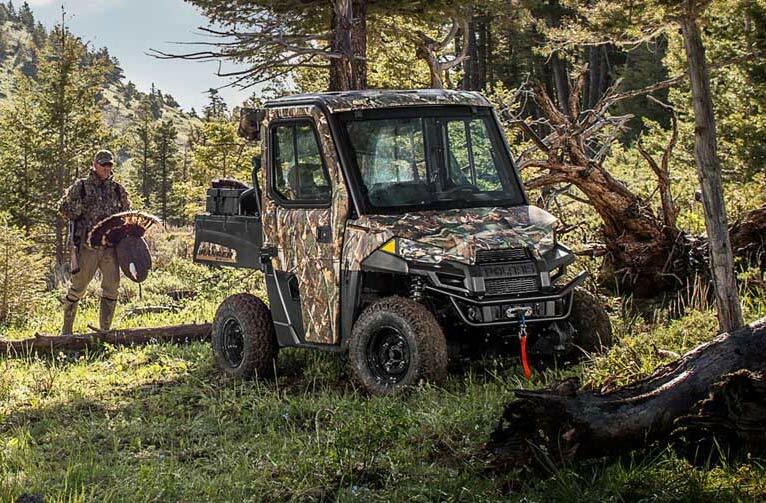 Additionally, a 58-inch width allows the EV to fit in the bed of most full-size pickups. 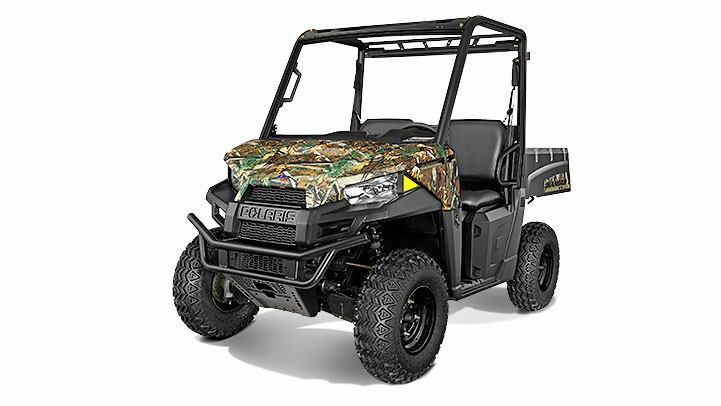 Versatile Carlisle Tires Versatile Carlisle tires are turf friendly and offer good traction and easy steering for use in a variety of terrain conditions. Styling with a Purpose NEW! The RANGER EV headlight shape allows for an enhanced 50W beam spread, so you can navigate dawn, dusk or machine sheds efficiently. Updated easy entry and exit of the vehicle plus great sight lines.